Copyright 2002-2011 American Cruisers Chapter Vienna All rights reserved. 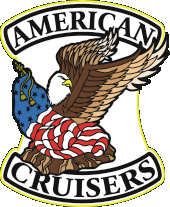 The American Cruisers (SM) name, American Cruisers (SM) patch and American Cruisers (SM) logo are trademarks owned by the American Cruisers Alliance, LLC, and may not be duplicated or used in anyway, on or off line, without the express written permission of American Cruisers Alliance, LLC. Other company names and trademarks used in materials on this website may be trademarks of their respective owners.